Do You Want To Succeed in College Admissions? Finish Something. 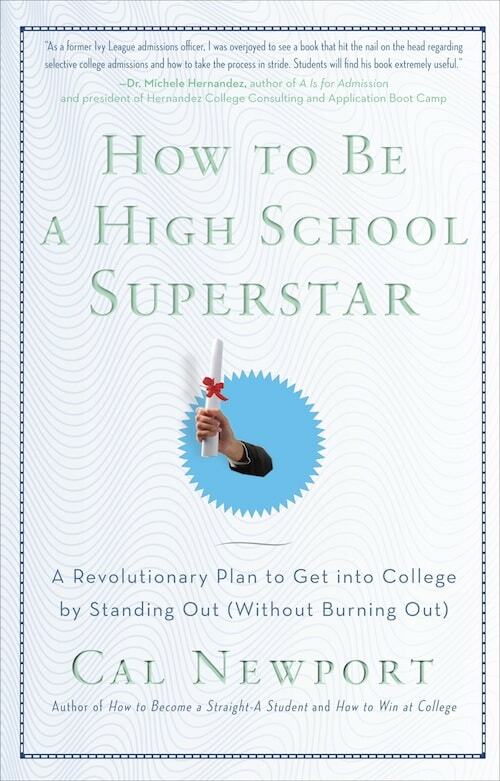 My third book, How to Be a High School Superstar, is one my favorite things that I ever wrote. The book is best summarized as a college admissions guide written in the style of Malcolm Gladwell. Within its pages, I dive deep into the science and psychology of impressiveness and argue that it’s possible to do well in college admissions without being stressed out and overworked (see this blog post for more details). the student surveys the new opportunities this makes available, then he or she repeats step #1. Follow this for strategy for a year (or even less!) and you’ll likely end up somewhere quite impressive (at least, by college admissions standards), without having to stress yourself out with twenty activities or attempting to become a world-class musician. I was going to be a sophomore in high school and I wanted to write a sports blog. “Hmm,” I said to myself, “let’s write it about the New York Knicks.” To be honest, I had never been a huge Knicks fan but always wanted to explore a professional sports team in-depth. I started writing blog posts every day. Pretty soon, I had a decent following. Among the community, within three months, I was quickly becoming a “go-to source” for Knicks info. I emailed the Knicks media department seeing if I could get credentials to Media Day where you interview professional basketball players. They said: “Sure, just send us your Google Analytics and we’ll see if we can approve you.” Sure enough, they did. My mom drove me. It was me and a bunch of professional journalists asking these basketball players a bunch of questions. There were kids who would have died to be in my position! Shortly thereafter, a writer from the New York Daily News mentioned me, my site, and my story in a blog post. Even though I had a subpar GPA and a decent SAT score, I got into my top choice. Great post. This extends to more than high school though. It is possible to apply this strategy in other areas of life. Great advice for high school students and the rest of us. Thanks Cal. It does make for a nice anecdote but I’m skeptical as to its educational value. Such unusual success within a reasonably short timeframe seems more like a fluke than anything else. There are lots of people who write blogs and never get to the ‘Pretty soon, I had a decent following’ stage, and not for lack of trying. I agree Cal, I completely agree. The 3 steps of the cycle you mentioned instantly struck a chord! I have been following this process especially actively after college, in my workplace. It works! Yes, it is an anti-plan activity to some extent, more dynamic and eventually turns out to be more interesting. Being free of The Plan to some extent reaps dividends. This does have all the hallmarks of the Zen Valedictorian all over it. I can understand how the guy in this post underscheduled. You simply don’t do much else outside of studying that requires any commitment. The underscheduling then allows him to focus intensely on his one extra-cirricular, which I assume was blogging, because you don’t get that successful at blogging if you have 5 or 6 other things vying for your time and attention. So the guy focuses and gets good, but how did he innovate? What did he do differently? Or was he chipping away at this for a number of years? I ask, because the story makes it sound like he rose to prominence within about 6 months. That seems remarkably good. What makes him an Outlier? Is someone in his circle of friends or his family experienced at blogger? What you write about him sounds like a Horatio Alger story. http://en.wikipedia.org/wiki/Horatio_Alger,_Jr. I’d be curious to know the details. AC, thank you for taking the time to comment and ask these questions. I will do my best to answer them. I had a goal of writing 1-2 blog posts a day… sometimes I even wrote as many as five posts a day. During my off time in school, I was constantly updating the site. The feedback that I was getting was positive, so I just kept going. It became somewhat of addiction. What did I do differently than other Knicks blogs? One thing that helped me tremendously was a series I did interviewing big media names in the Knicks community in the summer. This was important because I was able to form connections and gain some readership. The Daily News writer that later wrote about me was first interviewed a few months earlier. He knew I was a good kid trying my best. Deep down, I think he and others respected that when I got them on the phone. I started the blog in June 2010 as a way to pass time. I was updating the site regularly throughout the summer and did the interview series in August. I was gaining a following on Twitter. Media Day occurred late September 2010. That was my first real break. Because I was credentialed by the Knicks, it gave my site much more legitimacy. As the school year went on, I got more and more obsessed with blogging and the possibility of getting credentialed to actual games. The Knicks media dept. knew I was 15 years old and probably didn’t want to hurt their reputation so they refused to give me credentials to games. I think I’m an outlier because the people running most sports blogs are adults, sometimes getting paid full time for their work. No one in my circle of friends or family are experienced at blogging, and I got all the traffic from scratch – making connections, not having connections. You might be wondering about the current status of the blog. The NBA had a lockout that lasted from July 2011 to December 2011. This really hurt my motivation to blog. By the time the lockout was over, I was holding on to the site because I knew it could help me in the college process. Today, the site is not in existence anymore because I don’t have the passion. If I couldn’t do the site the way I wanted to (daily updates, articles, player and team analysis), I didn’t want to do it at all. Excellent advice. I am frustrated I had not come across your blog and book 2 years ago, because I’m sure I’d be at a much better school right now. Hey Cal, I have been spending quite a lot of time on your blog trying to gain new perspectives. This comment is not directly related to the article but I will make anyway. I wanted to read your approach to programming classes but could not find anything about this on your blog. Have you done anything special/different for those classes? As you know they are often intense classes and I think many people would be interested to read about this subject, including myself. Excellent book, Cal. Reading through your book made me glad that I sidestepped overcommitting myself outside of study time. But, I wish I dropped a couple of AP classes and filled my free time with interesting random opportunities back in high school. Also, do you currently have a system for reader questions and answering them? The only one I know of is your comments section here since you deactivated your e-mail account, and there’s no other substitute I know of. In the previous post, you were again saying that the “finding (uncovering) your passion” stuff is bunk. Is it just me, or are Step 1 and the “finding/uncovering your passion” stuff a bit at odds? Perhaps the passion-debunking doesn’t need to be so black-and-white. Yes, obsessing about finding passion can be a distraction from actually *doing the work* and getting good/great at something. But, at its core, there has to be an interest in said work to at least enjoy it enough to not want to scream at the thought of putting in serious, dedicated, focus work to get…better. At its core, if you’re going to do something with an Intent to Master, you have to have at least a significant interest in said thing. Otherwise, why the heck would you devote a significant chunk of your life to putting in serious, dedicated work to getting good/great at that thing? Perhaps it’s time to lay the Passion Slaying to rest and embrace a line of thinking that isn’t so quick to write off the importance of actually being interested in one’s work as one works to become So Good. My vote is for the aforementioned cycle. Methinks it’s not just for high school students. Sounds like a good book, will definitely check it out! I just want to tell everyone to BUY THIS BOOK! Read it, love it, and live it. It will absolutely change your life. I read it twice last Spring and I have just started High school, and I have already got plenty of stuff going on. Even though I was already doing something similar to what this book describes, my success has dramatically increased due to it, and it’s just unbelievable. There is a student who turned an activity available to all students at school into a ‘how’d she do that’. The HS had a science museum and program all students were exposed to. The particular freshman was one of a group who decided to do extra work in the program after school because it seemed interesting. The student volunteered for extra trips to do field work during breaks and summer. The work was interesting and the student decided to take an elective to study the science in more depth. Soon the student was a designated leader for the freshmen trips, gaining more experience. The student continued after school lab work and summer field work and took another elective to do independent research–student was able to work alongside researchers from the Natural History Museum and university professors. Student was able to find museum quality specimens. The student was invited to represent the museum at professional society conferences and gave poster presentations of findings. Student was coauthor on abstract in professional journal. When a magazine was looking for a student to write an article about the work of the HS and museum, student was naturally selected as being the most experienced. So student simply took advantage of what was available more than others did, allowing additional opportunities to present. The student was admitted to top choice highly selective college with this impressive resume, having strong but not stratospheric grades. But the benefits didn’t stop. Student was exposed to research and perused it in college too, even as a freshman, in new areas. Student was admitted to a PhD program, likely based on the extensive body of undergraduate research. Not many HS have this type of opportunity, but interestingly, many students simply had nothing to do with it beyond the freshman requirements. I can’t say that this student still didn’t work very hard and have significant other commitments. Though this was the wow factor, for sure. 1. The authors advice makes sense because you should always be challenging yourself to do something you find interesting. The student demonstrates this by writing a blog every day; eventually this leads him to becoming a sports journalist, and getting into the college of his dreams. 2. This story appeals to so many colleges because it show them that he has a “go gettem” attitude. Colleges are looking for people who put themselves out there and who are confident in what they want to do.